Live from Los Angeles every weekday morning Sam and Rachel bring you an entertaining and irreverent show that mixes a variety of the day's topics with funny and smart conversation. The show features a breadth of fascinating guests, bestselling authors and celebrities. 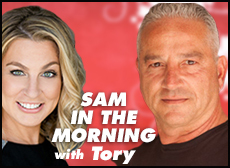 Live from Los Angeles every weekday morning Sam and Tory bring you an entertaining and irreverent show that mixes a variety of the day's topics with funny and smart conversation. The show features a breadth of fascinating guests, bestselling authors and celebrities. 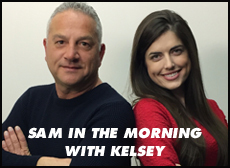 Live from Los Angeles every weekday morning Sam and Kelsey bring you an entertaining and irreverent show that mixes a variety of the day's topics with funny and smart conversation. The show features a breadth of fascinating guests, bestselling authors and celebrities. Live from Los Angeles every weekday morning Sam and Jen bring you an entertaining and irreverent show that mixes a variety of the day's topics with funny and smart conversation. The show features a breadth of fascinating guests, bestselling authors and celebrities. Enjoy your morning at the office with spicy talk and smart humor. Call in live and chat with us. SAM IN THE MORNING with CHARLOTTE serves a variety of the day's topics with funny and smart commentary, as well as a look into our lives. The show features a breadth of amazing guests and callers to keep you entertained. Live from Los Angeles every weekday morning (10-11AM PST), Sam and Charlotte bring you the most entertaining and irreverent show on talk radio. Enjoy your morning at the office with spicy talk and call in live and chat with us on the air. Live from Los Angeles every weekday morning (10-11AM PST), Sam and Mia bring you the most entertaining and irreverent show on talk radio. SAM IN THE MORNING with MIA serves a variety of the day's topics with funny and smart commentary, as well as a look into our lives. The show features a breadth of amazing guests and callers to keep you entertained. Live from Los Angeles every weekday morning (10-11AM PST), Sam and Bridgetta bring you the most entertaining and irreverent show on talk radio. SAM IN THE MORNING serves a variety of the day's topics with funny and smart commentary, as well as a look into our lives. The show features a breadth of amazing guests and callers to keep you entertained. SAM & STEPH IN THE MORNING serves a variety of the day's topics with funny and smart commentary, as well as a look into our lives. The show features a breadth of amazing guests and callers to keep you entertained. Live from Los Angeles every weekday morning (10-11AM PST), Sam and Steph bring you the most entertaining and irreverent show on talk radio. Enjoy your morning at the office with spicy talk and even some cool music. Call in live and chat with us on the air. 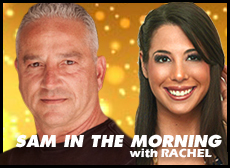 SAM & STEPHANIE IN THE MORNING serves a variety of the day's topics with funny and smart commentary, as well as a look into our lives. The show features a breadth of amazing guests and callers to keep you entertained. Live from Los Angeles every weekday morning (10-11AM PST), Sam and Stephanie bring you the most entertaining and irreverent show on talk radio. Live from Los Angeles every weekday morning (10-11AM PST), Sam and Kara bring you the most entertaining and irreverent show on talk radio. SAM & KARA IN THE MORNING serves a variety of the day's topics with funny and smart commentary, as well as a look into our lives. The show features a breadth of amazing guests and callers to keep you entertained. SAM & SHARI IN THE MORNING serves a variety of the day's topics with funny and smart commentary, as well as a look into our lives. The show features a breadth of amazing guests and callers to keep you entertained. MORNINGS serves a variety of the day's topics with funny and smart commentary, as well as a look into our lives. The show features a breadth of guests and callers to keep you entertained. 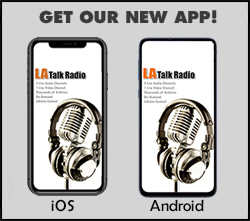 Live from Los Angeles every weekday morning (9AM-11AM PST), SAM and ANDREA bring you the most entertaining and irreverent show on talk radio. SAM & SUZY IN THE MORNING serves a variety of the day's topics with funny and smart commentary, as well as a look into our lives. The show features a breadth of amazing guests and callers to keep you entertained. Live from Los Angeles every weekday morning (9AM-11AM PST), SAM and SUZY bring you the most entertaining and irreverent show on talk radio. The greatest morning show on Earth? Well, yeah! Suzy was one of those rare people who has a heart and a soul. While Sam tried to keep the show focused, Suzy entertained us all with her outrageous stories and carefree lifestyle. She moved to Australia, and that was the end of this hugely popular show. There will never be another Suzy. "The Sam & Manu Show" serves a variety of the day's topics with funny and smart commentary. The show features a breadth of guests that reveal their lives and talents to you. Live from Los Angeles, Sam and Manu bring you the most entertaining and irreverent show on Internet talk radio. Enjoy your morning at the office with spicy talk and even some incredible music. Call in live and participate.